Many Americans think of Iowa as having little topographic variation. However, in westernmost Iowa the Loess Hills rise 200 feet above the flat plains forming a narrow band running north-south 200 miles along the Missouri River. The steep angles and sharp bluffs on the western side of the Loess Hills are in sharp contrast to the flat rectangular cropfields of the Missouri River flood plain. From the east, gently rolling hills blend into steep ridges. Loess (pronounced "luss"), is German for loose or crumbly. It is a gritty, lightweight, porous material composed of tightly packed grains of quartz, feldspar, mica, and other minerals. Loess is the source of most of our Nation's rich agricultural soils and is common in the U.S. and around the world. However, Iowa's Loess Hills are unusual because the layers of loess are extraordinarily thick, as much as 200 feet in some places. The extreme thickness of the loess layers and the intricately carved terrain of the Loess Hills make them a rare geologic feature. Shaanxi, China, is the only other location where loess layers are as deep and extensive. Though much older (2.5 million years) and much thicker (nearly 300 feet) than Iowa's loess, the Shaanxi loess hills have been greatly altered by both natural and human activity and no longer retain their original characteristics. Although early geologists assumed loess was either fluvial (deposited by a river) or lacustrine (formed in a lake), today we know that loess was eolian (deposited by the wind). During the Ice Age, glaciers advanced down into the mid-continent of North America, grinding underlying rock into a fine powderlike sediment called "glacial flour." As temperatures warmed, the glaciers melted and enormous amounts of water and sediment rushed down the Missouri River valley. The sediment was eventually deposited on flood plains downstream, creating huge mud flats. The steeply ridged bluffs of the Loess Hills' Murray Hill rise abruptly from the agricultural fields of Iowa. Photo courtesy of the Geological Survey Bureau, Iowa Department of Natural Resources. During the winters the meltwaters would recede, leaving the mud flats exposed. As they dried, fine-grained mud material called silt was picked up and carried by strong winds. These large dust clouds were moved eastward by prevailing westerly winds and were redeposited over broad areas. Heavier, coarser silt, deposited closest to its Missouri River flood plain source, formed sharp, high bluffs on the western margin of the Loess Hills. Finer, lighter silt, deposited farther east, created gently sloping hills on the eastern margin. This process repeated for thousands of years, building layer upon layer until the loess reached thicknesses of 60 feet or more and became the dominant feature of the terrain. The Loess Hills are comprised of three major layers. From oldest to youngest, the layers are known as the Loveland Loess, (120,000 to 159,000 years old), the Pisgah Loess (25,000 to 31,000 years old), and the Peoria Loess (12,500-25,000 years old). 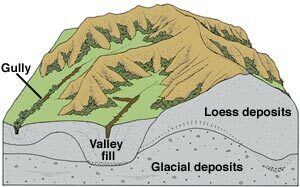 Clues in the loess layers help geologists determine the rate at which the loess was deposited. For example, ripples mean accumulation took place very quickly. Thin dark bands in the loess indicate the presence of soil and vegetation which means little or no deposition was occurring. Erosion has exposed other geologic formations beneath the loess, such as glacial deposits of sand and gravel and much-older limestone rocks. A 15-inch layer of volcanic ash can be seen in some road cuts, the result of eruptions at now-extinct volcanoes near Yellowstone National Park in Wyoming more than 710,000 years ago. Areas of solid bedrock can be observed in deep quarries along the western edge of the Loess Hills. The Loess Hills are a rare and unusual landform, but they are not permanent; loess terrain is dynamic and rapidly evolving. When originally deposited, the loess was smooth like a sand dune or a snow drift. 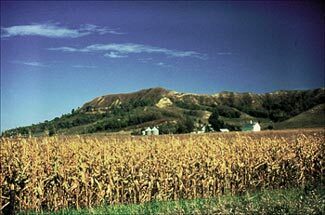 Today, the Loess Hills are rough and jagged, the result of erosion by the very elements that created themãwind and water. The pie-crust shapes of these hills are the result of extreme erodibility of loess by wind, water, gravity-induced slipping, and human activity. When dry, loess particles form stable surfaces. Wet loess, however, is very susceptible to collapse and erosion because of a lack of clay particles which normally bond wet soils together. 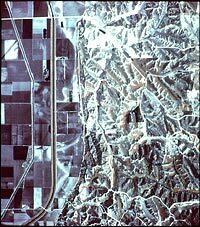 Color-infrared image taken 40,000 feet above the Loess Hills. Courtesy of the Geological Survey Bureau, Iowa Department of Natural Resources. Block diagram of the present landscape of the Loess Hills showing features above and below the surface. Adapted from Landforms of Iowa, Jean C. Prior, Geological Survey Bureau, Iowa Department of Natural Resources. (University of Iowa Press, Iowa City, 1991). Illustration by Patricia J. Lohmann, p. 49. Erosion has sculpted the Loess Hills into unusual shapes. The irregular ridge crests are called peaks and saddles because they resemble an animal's back. Distinctive staircases-like features on the slopes of some hills are known as catsteps and are actually the result of slipping soil. Humans inhabited the Loess Hills as early as 12,000 years ago, but the earliest written descriptions of the Loess Hills appear in journals from the Lewis and Clark Expedition, which travelled through western Iowa in 1804. Later immigrants who settled in and around these hills farmed the fertile rockless soil and grazed cattle on hillsides too steep for planting. The Loess Hills also provide natural resources such as building materials and fill dirt for highways and railroad construction. The Loess Hills of Iowa are extremely fragile. They have one of the highest erosion rates in the U.S., almost 40 tons/acre/ year. Erosion from rainfall and flooding removes loess from the hills and redeposits it on the flood plain from which it came. Increased sediment in the streams can be harmful to fish and plants, and drainage ditches must be continually dredged as they become choked with sediment. Gullies, although a natural part of this landscape, are a serious problem. They can be many miles long, more than 100 feet wide, and as deep as 80 feet. Bridges and roads collapse as the gullies widen, restricting farmers' access to their fields. Human activities such as farming and mining can exacerbate erosion. Today, farmers practice terracing and contour farming in an effort to limit erosion. The Loess Hills are home to several endangered plant and animal species. The uniqueness of the landscape and biota led to recognition of portions of the Loess Hills as a National Natural Landmark in 1986 by the U.S. Department of the Interior. The valley floor at the base of the Loess Hills is deeply sliced by steep-sided gullies such as this one. Photo courtesy of the Geological Survey Bureau, Iowa Department of Natural Resources. 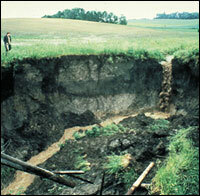 The clearing of land for agricultural use has accelerated the rate of gully formation. Evidence of soil loss and the susceptibility of loess to gully erosion has prompted new research into landscape processes and preservation strategies. The USGS, in conjunction with the Iowa Department of Natural Resources, the Agricultural Research Service, and university researchers, is conducting detailed investigations on erosion rates and the effects of erosion on soils. Because loess was deposited by Ice-Age winds, it contains a record of past climates in the form of wind direction. Studies show that some of the loess in the Loess Hills came from sources much farther west than the Missouri River valley, indicating the presence of a westerly wind during that time. However, computer simulations show that winds would have come from the northeast. The USGS, in cooperation with the Iowa Department of Natural Resources, is gathering geologic information critical to testing computer models of past climates. For more information on USGS activities and products, contact us toll-free at 1-888-ASK-USGS or visit our home page on the World Wide Web at www.usgs.gov.